Cut Grandson love it this is soft. Take to the seas with the Lums quilt set from Taylor & Olive. With the sweet nautical style of whales printed on navy blue background, this set is an ocean escape for your little one. 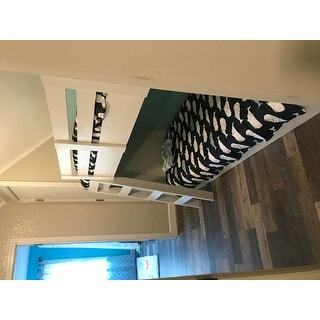 We ordered 2 of these sets (size full/queen) for bunk beds. They arrived quickly and were packaged well. The quilt is beautiful and seems to be a very good quality. The pillows are as expected, though one of ours had a slight flaw in the fabric, not significant enough to even bother with asking for a replacement. Compared to the picture, the light blue of the accent pillows is a lighter in person (very pale blue). The other colors are about accurate. The wave pattern at the top of the bed is actually the underside of the quilt (very cute), not a sheet, as we thought. The quilt seems to be just about a standard full-size. Not sure how much coverage you would get on a queen, but it definitely wouldn't hang as low as the picture shows. You would need a bed skirt with either a full or queen bed (we're tucking the quilt under the mattresses, due to having bunk beds). Overall, great set. No complaints. I bought two of these sets for a bunk bed. I am extremely happy with the purchase and for the price I paid during one of the bedding sales. They are extremely cute and I love the navy/aqua/white contrast. The colors were as expected. A few notes depending on what you are looking for and your expected level of detail. The quilt is just that a quilt, so it is pretty thin and not ultra soft. It has a slight sheen to the material. It being thin it will work well in the bunk area to be able to tuck in and look tidy. The quilt is reversible, which I like that I can fold over the top and show a little more contrast. The anchor pillow is fully stuffed and not so cozy to actually lay your head on (which is fine as we intended it just for decoration). The navy and white stripes, as stitched, do not line up from front to back. The whale pillow has a super soft exterior and I am pleased with the size. Again, this pillow is super stuffed. The whale pillow also only has the face detail on the front. The back is just completely aqua with no detail. This quilt is so cute. The navy is nice & dark, making the bright white and aqua really pop. I ordered a twin size for my son’s bed, and the quilt sizing is perfect - lots of overhang on each side, not at all skimpy like some quilts. Keep in mind that this is not a patchwork quilt, and it’s made os microfiber, which accounts for the low price. Even so, it is well-constructed and super cute. My daughter loves her new whale quilt set. The color and quality are great. The quilt is soft. The added pillows are a favorite as well. When I purchased this quilt set it was sold by Lush Decor. I actually ordered 2, but the other was from a different website because the twin was not available on overstock at the time. The twin size came in and was great, but the queen/full that I ordered from here came and the material was faded- it was not a crisp navy like the other. I kept it instead of going through the hassle of sending it back, but after about 6 months, the faded one next to the other in the same room drove me nuts, so I ended up re-ordering it from another vendor. The new one came and the colors were right on it. Overall, I love the bedding, but I am just not sure if the first set I got was a lemon or if it was a washed and returned item or what. The colors have held up on the two sets that arrived un-faded. So cute in the pink and such a great deal! Was so happy to find this set and at such a great deal! The pink and gray is a sweet combo and my daughter loves her new pink whale pillow. The reverse of the quilt is a sweet pink pattern as well - we pair it with both a pink ticking stripe sheet set, as well as a gray stripe jersey set. The cotton is brushed, so has a soft feel to it - would recommend a blanket in colder months or air conditioning as this quilt is definitely more of thin, coverlet type weight. This a bright addition to my grandson's room. I bought two sets for the bunk bed and they look great. The quilt is well made with a bright blue wave pattern on the back that is reversible if you want a different look for the room. 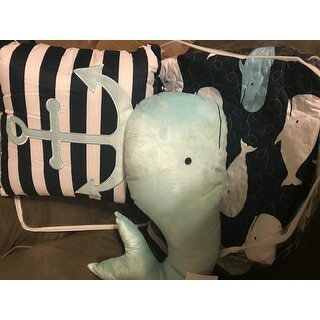 The pillow cover and whale and anchor pillows are fun, and a separate pillow of this type was around $20, so this set is a great value. This set was kid approved at my house. My 4-year-old has really been into whales and she loved this set in pink. The pink has a slight coral color to it. I'd still say it's more pink than orange. Online, the background appears more beige, but it's very much grey by. The underside is done is a wave motif and it's darling. Love that it comes with the decorative pillows. Love my quilt set and I know my grandkids will as well. Bright colors, good quality, would recommend. This quilt is great quality and my daughter loves it for her room. The whale pillow adds such a cute touch. Bought 2 sets. They are the cutest bedspreads I have bought for my beach house. Bought 2 of these for our beach house I love the quality and style ! This set is adorable!!! My son loved the whales., especially the cute whale pillow. Everything was just as described and the shipping was extremely speedy. 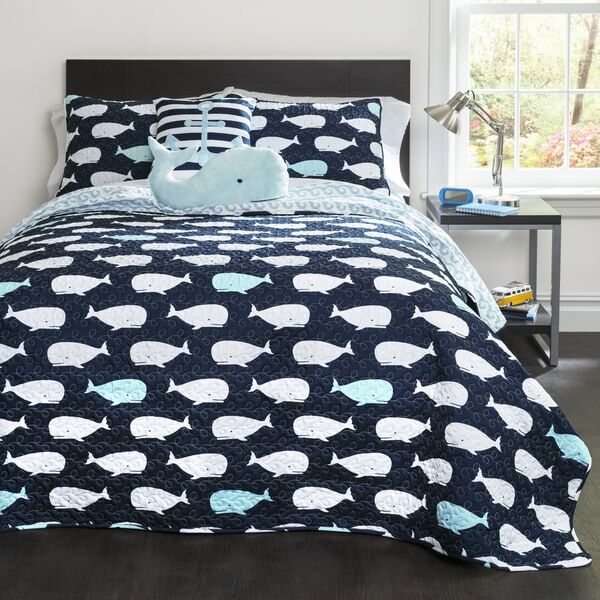 This quilt is so cute and the kids love the whale pillow. I love the design and am very pleased with the quality. It is a medium weight cover, perfect for the warmer climates. I use an extra blanket during mild winters and keep nice and warm. super cute. high quality fabric, as can be expected with all Lush products. This bedding set is just adorable! 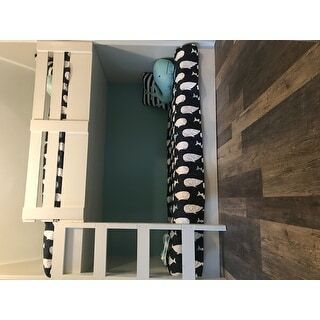 My 6 year old daughter loves the ocean, and was dreaming if a beach-inspired bedroom....and this bedding made her delighted!!! The added pillow is just a fun perk! It is soft and comfortable, and too cute! Highly recommend. "Is the lighter color in the quilt more light blue or turquoise ?" "Will the navy twin set be coming back in stock?" "Will you be getting the navy twin back in soon?" They will be coming back next month. "Does this set come with the whale pillow?" This quilt set does come with the whale pillow.